Although better known for its cramped market stalls and throngs of ‘old people’, Hala Mirowska has become the unlikely setting of what has become one of the most talked about restaurants of the year. 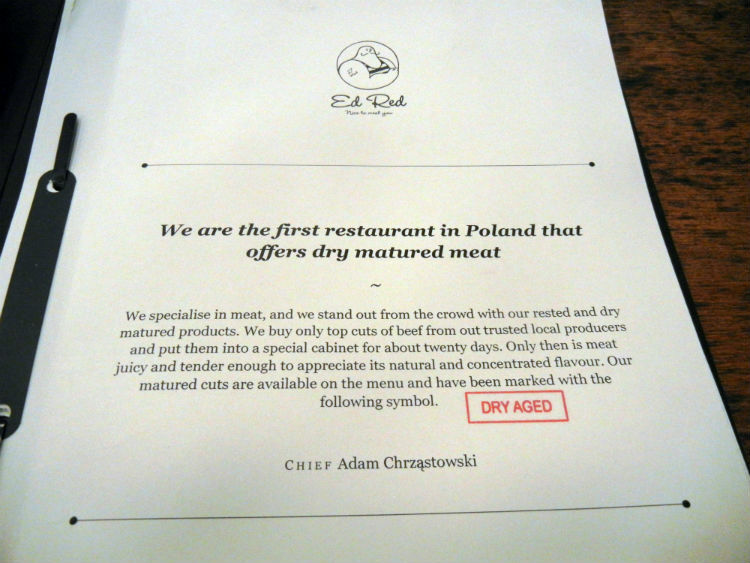 Originally of Krakow, the opening of a Warsaw branch of Ed Red has been widely hailed across town; visiting, you soon understand why. Climbing a set of clanky stairs, a heavy door leads out to a generous space dominated by booth seating and high ceilings. The design is thoughtfully casual and a departure from the broody, upscale environment found in the city’s more corporate minded steakhouses. 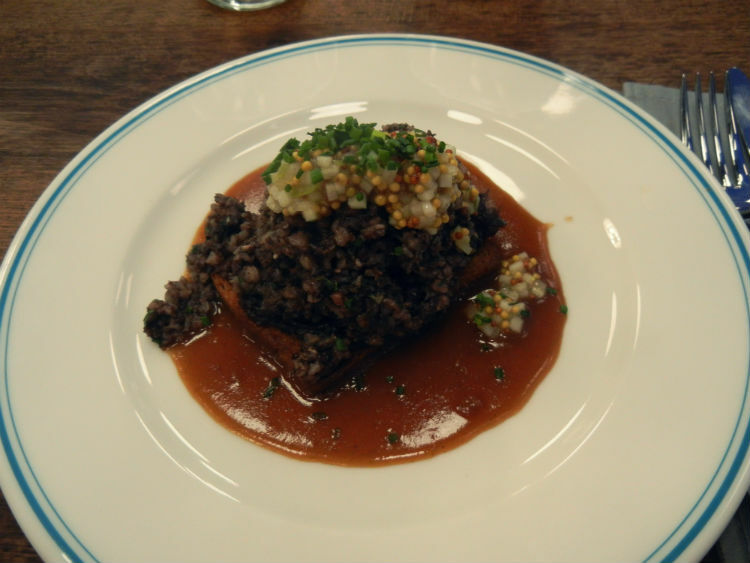 Starters are high on meaty challenges that, at times, sound positively medieval: stuffed pig’s head, for instance. Our table sticks to smoked marrow bones and blood sausage with onion, apple and fried bread and both are a universal success. For mains, it’s steak all round. Served with a commando knife, these are big cuts of cow cooked with accuracy. Judged as ‘excellent’, the price (approx. zł. 85-90 for 300 grams) is also appreciated by all. 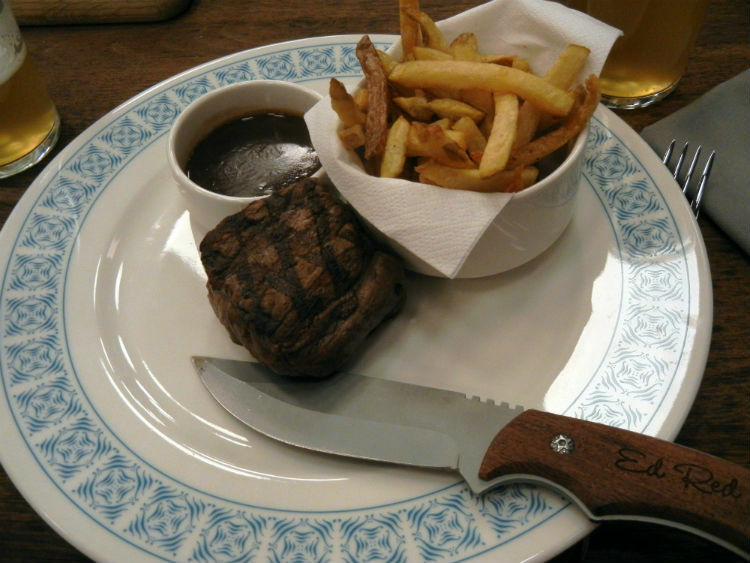 It’s not cheap, but it is at least cheaper than Warsaw’s other top steakhouses. 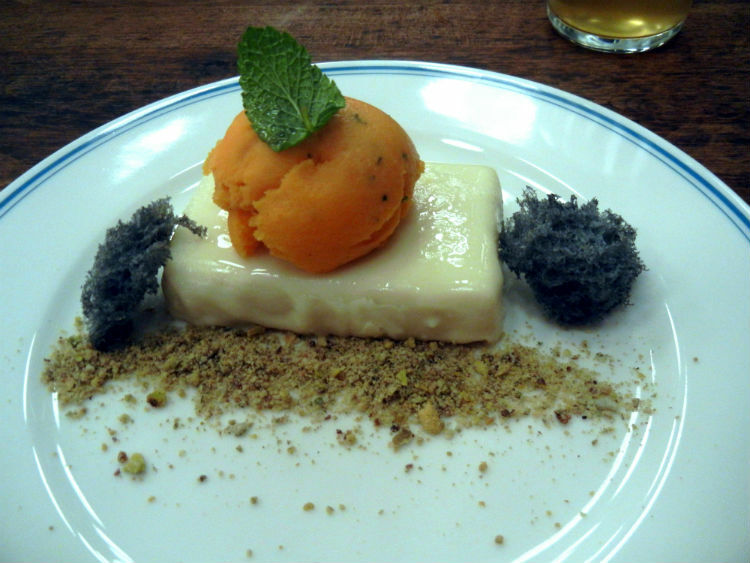 Desserts are fine, and include a sea buckthorn sorbet served on ginger marshmallow. In truth, while it’s a competent climax, there’s a suspicion that this is too sweet and heavy after what’s gone before. Eating, all of a sudden, has become a labored operation. Nonetheless, there is something immensely likeable about Ed Red. It’s a place in which to linger, a place that evokes feelings of deep satisfaction – most of all, it’s a place to savor and enjoy.